These task cards ask students to look at Nick's descriptions of the 6 main characters and consider the overall impression of each. The cards indicate which chapter the students should look in for each character. 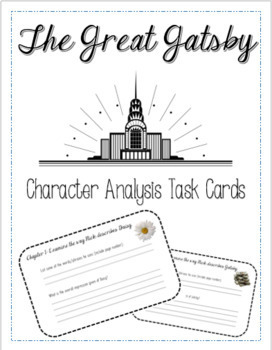 Students can complete this activity after reading chapters 1-3. You can make multiple copies and have students write on them or cut them out and let them pass the cards from group to group. There are 6 task cards total.